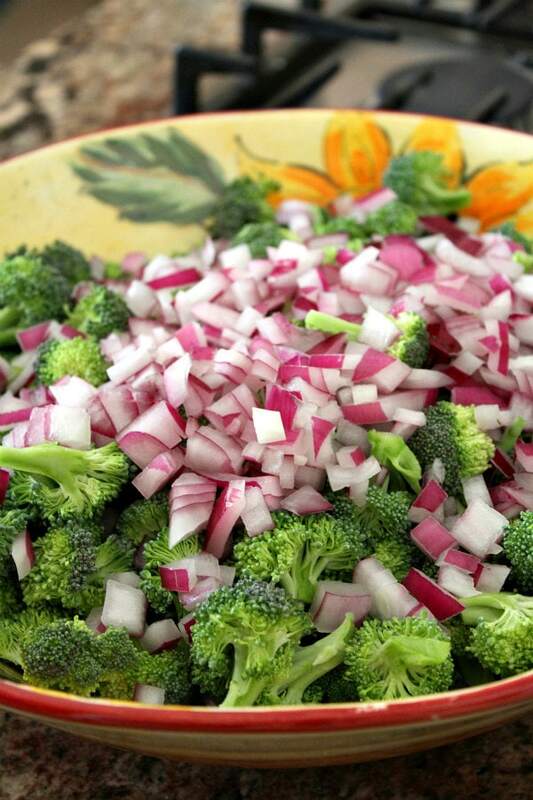 This is the best Broccoli Salad recipe! Watch the video showing you how to make this recipe, then scroll to the bottom of this post to print out the complete recipe. I have a big sister, and her name is Susie. Susie was off to college when I was only in elementary school, so we didn’t really get a chance to do many things together. As I got older, I often visited her in the summers, and we began to share recipes and talk on the phone a lot. I’ve always considered her “fashion-forward” and someone who has a good eye for design. Another talent of Susie’s is that she has always been an excellent cook. 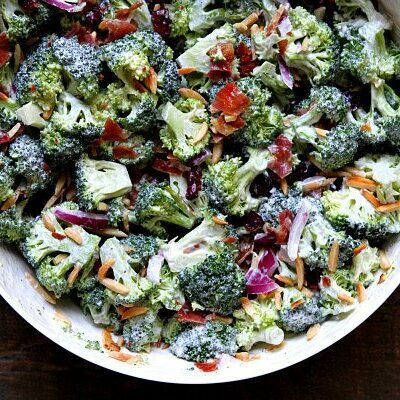 At our family reunion this summer, she brought this delicious Broccoli Salad to share (her creation after looking at a handful of recipes). It’s full of all kinds of goodies, and it’s tossed in a creamy- but light- dressing. It’s a good way to get everyone to eat their vegetables. 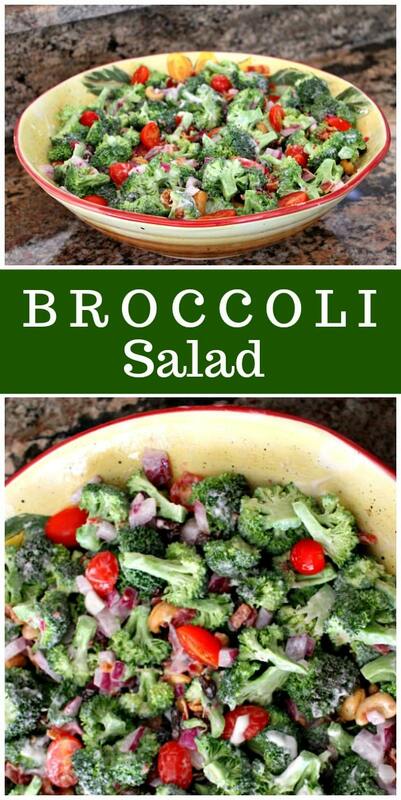 How do you make Broccoli Salad? 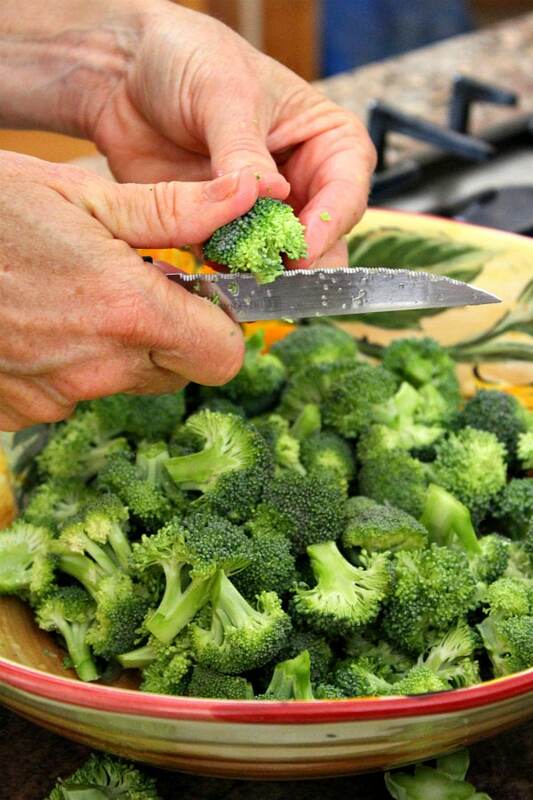 Start with fresh broccoli of course- about 1 large bunch. Cut it into small, bite-sized florets. Put in in a large bowl. 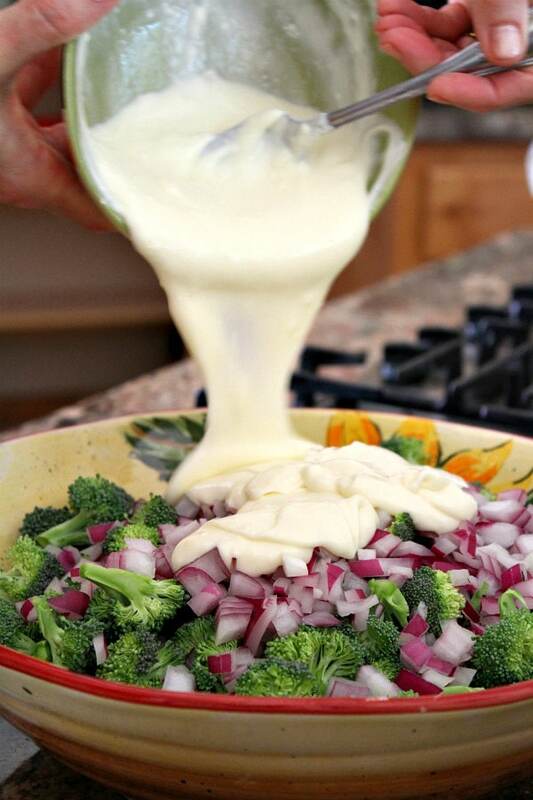 Then toss it all with the creamy dressing (see the recipe for details). Hey, there’s my nephew (Susie’s son) Matt peeking in on the recipe! He’s a cutie. But sorry girls… he’s taken. Add the rest of the goodies, including tomatoes, raisins, cashews and BACON. 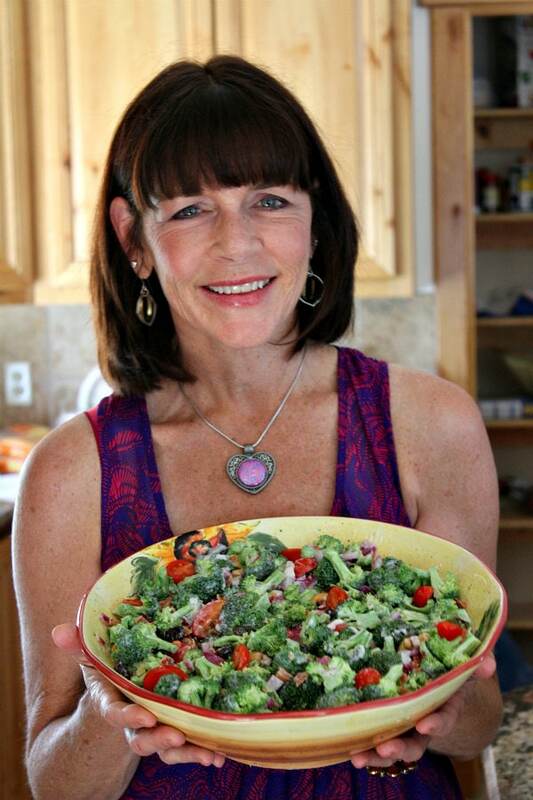 Toss it all again, and you’ve got Susie’s Broccoli Salad! 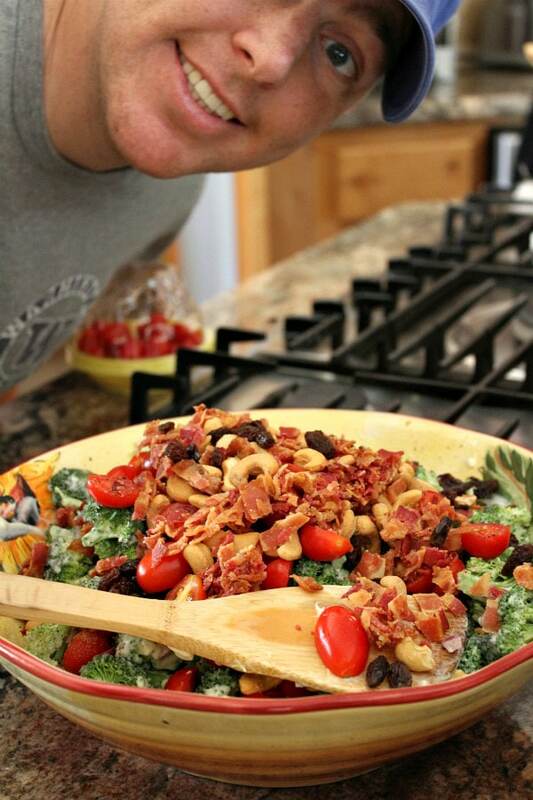 I love this salad every time I make it, and everyone else seems to love it too! And there is Susie- my wonderful sister. She’s a teacher, she loves to travel, she writes a book review blog called NOVEL VISITS, and she lives in the Northwest. And she actually happens to be single, so if you know anyone… be sure to let me know. Of course she’s going to DIE when she reads this. But that’s okay. I’m a pretty good matchmaker. I set up a college roommate once and she’s been happily married to the guy ever since. Anyway, the broccoli salad… it’s good! 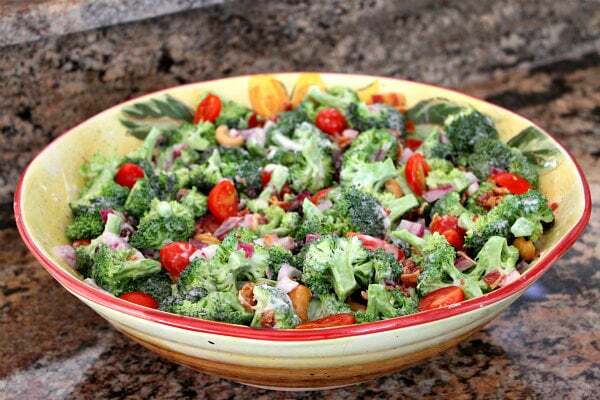 It got several raves at our family reunion from the people who would actually approach a salad with broccoli in it (because you KNOW there are people who are adverse to the whole idea). 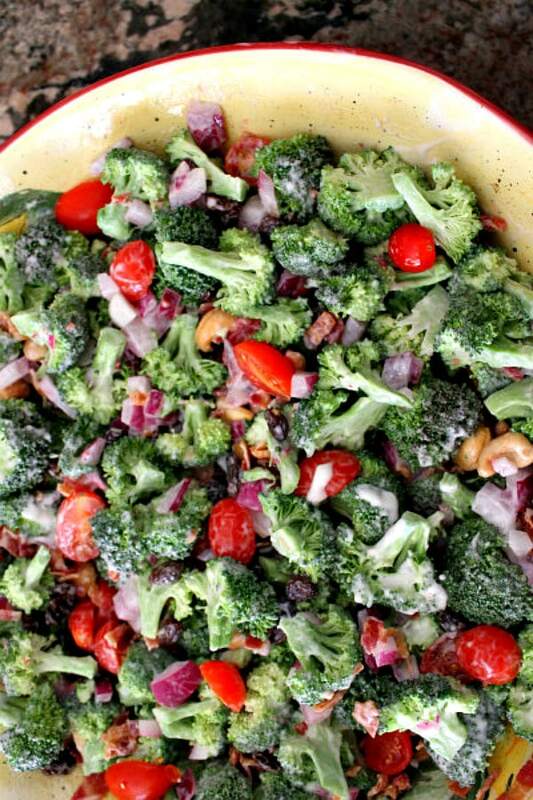 No need to fear a broccoli salad though. It’s good stuff. And it’s awfully nice to bring a salad to a party these days that isn’t your same-old greens/potato/pasta/ salad. This is something a little different. Thanks, Susie! If you’re looking for a few more salad recipes that are good to contribute to dinner, try my Waldorf Salad or this Italian Pasta Salad. I’m also pretty crazy about Grilled Corn Salad, Greek Panzanella Salad and Asian Chicken Cranberry Salad. 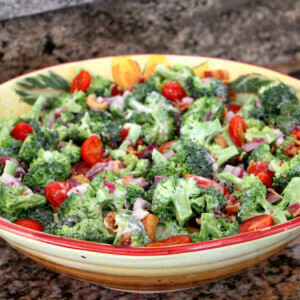 My favorite version of the classic Broccoli Salad! 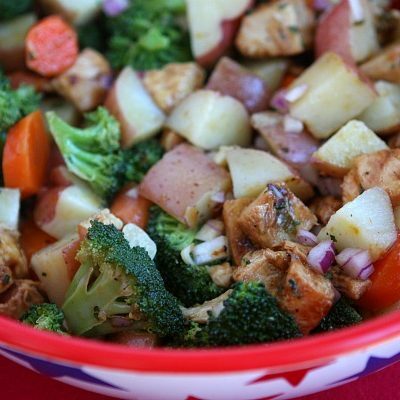 In a medium bowl, stir together the dressing ingredients and set aside. Rinse the broccoli and the flowerette ends into bite-sized pieces (discard the stems). 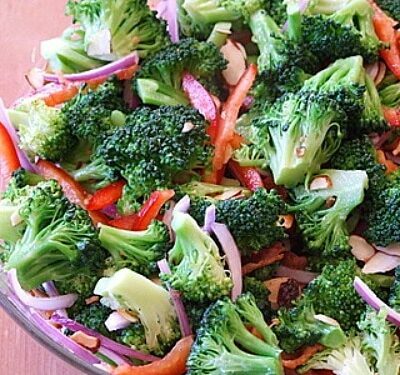 Place the broccoli in a large bowl. Add the onions. Add just enough of the dressing to coat the broccoli- add a little, toss, add a little more- until you have coated the broccoli lightly with the dressing (you may not use it all). Add the tomatoes, raisins, cashews and bacon. Gently toss to blend all of the ingredients evenly. Add more dressing, if needed (only if the salad is looking dry). Refrigerate until ready to serve. Can be prepared up to a few hours in advance, but it's best to toss with the dressing about an hour before serving. *Notes about the broccoli- Yes, it is served raw. And No, don't use frozen broccoli. *For easy clean-up, cook your bacon in the oven. Preheat the oven to 400[dg]F. Line a large, rimmed baking sheet with foil and place a rack on top. Spray the rack with nonstick spray. Lay the bacon slices on the rack. Bake it for 15 to 20 minutes, or until the bacon is crisp. Timing will vary depending on the thickness of your bacon. *Nutritional information was computed using "Light Mayonnaise." This recipe was originally posted in 2012. It was edited and re-published in 2018. If you are preparing this recipe as GLUTEN-FREE, just be sure to use brands of mayonnaise and bacon that are known to be GF. I’ve been making a variation of this…..broccoli and cauliflower florets, grapes, and scallions. For the dressing I substituted agave syrup for the sugar (which doesn’t always dissolve). I need the nutritional values! On a diet… how many calories? I do not have that- but you can use an online recipe calculator to figure that out, if you need to! I just made this salad and I’m devouring it at lunch! It is really yummy! Just the right amount of sweetness and crunch. 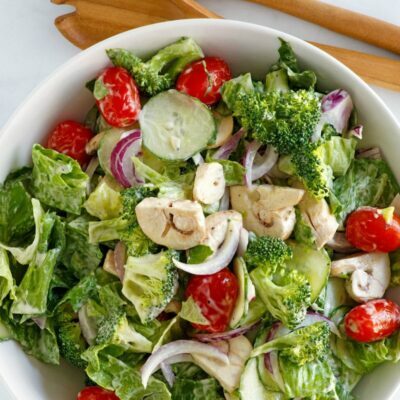 Thanks for this great refreshing salad recipe! This is one of my favorite salad recipes. I use mandarin oranges instead of tomatoes with a little orange juice in the dressing. Great tip on how to prepare the bacon. Never thought about baking it. Turned out great!